Bargain Briana has put together a great list of Earth Day Freebies. Here are a few great ones that I haven’t told you about. For a complete list, visit Bargain Briana. Thanks, Briana! Get a $13.95 credit for thredup.com. Use on a box of pre-loved kid’s clothing and pay just $2 after the credit! Get a FREE recycled canvas tote with a $40 purchase at Burt’s Bee’s with promo code EARTH11. Gain FREE admission to over 394 National Parks from April 16 through April 24, 2011 for National Parks Week. Join Anthropologie for a FREE Earth Day craft workshops for kids. Offers Apr 22, 2011 in EarthDay, free · Expired! Lowe’s: FREE Tree On Earth Day! Head over to Lowe’s on Saturday, April 23rd to get a FREE tree. 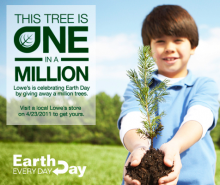 In honor of Earth Day, Lowe’s will be giving away 1 million trees! Check with your local Lowe’s and make sure they are participating. Offers Apr 21, 2011 in EarthDay, free · Expired! Starbucks: FREE cup of coffee or tea on Earth Day! In honor of Earth Day, bring in a reusable travel cup to your local Starbucks store on April 22nd and get a free cup of coffee or tea! This offer is valid at participating locations. Call ahead to make sure your favorite store is participating! Offers Apr 20, 2011 in coffee, EarthDay, free, Starbucks · Expired! Disney Store: FREE Reusable Tote Bag! Stop into your local Disney Store on Earth Day on Friday the 22nd of April and receive a FREE reusable tote. You’ll need to bring in 5 plastic grocery bags to recycle to get your free tote bag. This offer is good only while supplies last and limited to one per guest. Offers Apr 20, 2011 in EarthDay, free · Expired! Origins: FREE full size cleanser on Earth Day! This may be one of my favorite Earth Day freebies. Get a FREE full size facial cleanser from Origins. You can choose between two different cleansers, Checks and Balances or A Perfect World. They did this same promotion last year too. All you need to do is fill out the form here and take this along with any cleanser that you are currently using. If you don’t currently use cleanser or you’re out, head to one of the drugstores and grab one for less than $1. The Origins cleanser is valued at $18. This offer is only good on April 22nd while supplies last. Offers Apr 20, 2011 in beauty, EarthDay, free · Expired! 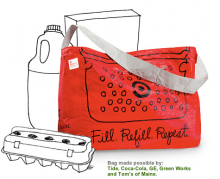 To celebrate Earth Day, Target will be giving away 1 million FREE Target Reusable Bags on Sunday April 17th. You’ll get the free back with any purchase! This offer is good while supplies last. Last year they ran out in just a few hours. If you really want one, get there when they open. Offers Apr 16, 2011 in EarthDay, free · Expired! 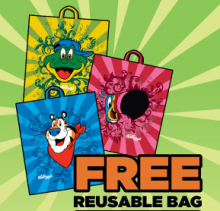 Kellogg’s has a fun tote bag offer for Earth Day! Head over to Kellogg’s and print the downloadable form. The tote bag is free with the purchase of two Kellogg’s cereals 10 oz. or larger. Supplies are limited. Don’t forget to print the Kellogg’s cereal coupons too! Congratulations to Anne for being the winner of our last Earth Day giveaway! Thank you to all of you who entered our giveaways this week! I hope you enjoyed Earth Day as much as we did! Giveaways Apr 24, 2010 in EarthDay · Expired! What a great week! Earth Day is awesome. I hope everyone found at least one way to make a lifestyle change. We have one final giveaway for this week. Since so many of you like the Lunch Skins, we’re giving away one more. Plus, you’ll get some fun samples and coupons stuffed in the baggie! Here are the samples and coupons you can win! Leave a comment below, about anything! Use a valid email, this is how I will let you know you’re the winner! Thank you for making Earth Day a fun week! Lunch Skins were created by 3greenmoms.com and Seven Plant was generous enough to provide Lunch Skins for our Earth Day giveaway. Green Works and House Party provided the samples and coupons. Giveaway ends 11:59pm April 23, 2010. US residence only. Giveaways Apr 23, 2010 in EarthDay, free · Expired! Our winner is Jason! Congratulations Jason. We hope you enjoy the film. This is a great documentary, if you haven’t’ seen it, you should. It’s a great one to have on hand and pass around to friends and family who haven’t seen it. Right now, you can get it on Amazon for a really good price. Thank you to everyone who entered our Food, Inc. giveaway! Giveaways Apr 23, 2010 in EarthDay · Expired!